Norwegian Air Shuttle ASA has today extended its current aircraft order with Boeing Commercial Airplanes for an additional 15 Boeing 737-800 to be delivered between 2015 and 2018. The total order for purchased aircraft now stands at a total of 78 whereof 19 have been delivered. "At Norwegian, we are committed to being progressive and thinking long term. This order gives us an opportunity to secure and invest in the company's future. 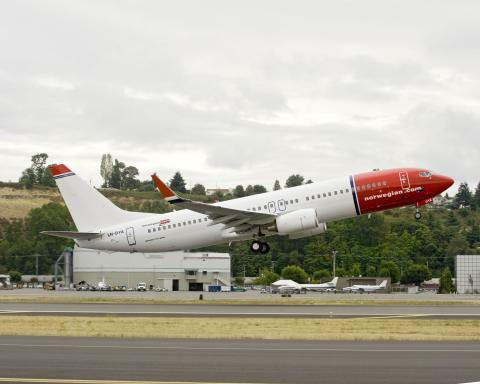 These new Boeing 737-800s aircraft will give us a tremendous competitive advantage, enabling us to reduce our overall costs even more," said Norwegian's CEO Bjørn Kjos. "Brand new, fuel-efficient aircraft are necessary for us to continue to grow. In the long run, owning is more advantageous than leasing and as we begin to phase out our older aircraft, it is crucial we are able to purchase new airplanes. From an environmental perspective, we know that Boeing is continuously working on measures to reduce emissions, making new aircraft a win-win for both the environment, our passengers and for us as a company,” he added. "Norwegian continues to be a leader in the industry by providing its passengers with both the new Boeing Sky Interior and Wi-Fi on its new Boeing 737-800s - this is a terrific combination for passengers on the most fuel efficient single-aisle airline operating in today's market," Boeing Commercial Airplanes Vice President of Sales & Marketing, Marlin Dailey, said. "Norwegian has achieved great success and we take pride in the 737's contribution to its achievements." Norwegian already offers the all new Boeing SKY aircraft interiors and in-flight WiFi on approximately 20% of its flights. Norwegian will offer fleet wide WiFi coverage from next year. The total order for purchased aircraft now stands at a total of 78 whereof 19 have been delivered. The future delivery stream of aircraft, mainly direct buy, is listed below. All future 737 aircraft will be fitted with CFM Evolution engines, Boeing SKY interiors and in-flight WiFi. See notice to stock exchange here. See press release from Boeing here. Norwegian Air Shuttle ASA, commercially branded “Norwegian,” is a public low-cost airline noted on the Oslo Stock Exchange. The company is the second largest airline in Scandinavia, and has a route portfolio that stretches across Europe into North Africa and the Middle East. With competitive prices and customer friendly solutions and service, the company has experienced significant growth over the previous years. With more than 13 million passengers in 2010, Norwegian is the 3rd largest low-cost airline in Europe. Norwegian currently operates 57 aircraft on 238 routes to about 100 destinations and employs approximately 2 500 people.